Borax is a naturally occurring mineral deposit produced by repeated evaporation of lakes and riverbeds. The term Borax loosely refers several different chemical compounds based around the Sodium Tetraborate structure with varying number of water molecules attached to it. The most commonly occurring Borax compounds are: Borax Anhydrous (Anhydrous means “without water”), Borax Pentahydrate (Pentahydrate means 5 water molecules), Borax Decahydrate (Decahydrate means 10 water molecules). An example of the Borate anion structure which bonds ionically to Sodium (Na) and any water molecules is shown to the right. Borax (in any form) is a white crystalline solid at room temparature and is chemically stable under normal storage conditions; Borax Decahydrate has a molar mass of 381.38, its melting point is 1016 Kelvin (743 C) and its boliding point is 1848 Kelvin (1575 C). The solubility of Borax increases with water temperature; at 0C water temperature Borax will dissolve to produce a maximum % by weight saturated solution of 1.99% in contrast at 100C water temperature this increases to 65.64%. When dissolved in water Borax hydrolyses to produce a mildly alkaline solution which maintains a constant pH level. What can I do with borax? Remove stains from rugs or carpets: Wet the area, then rub some dry powdered borax directly into the stain. Let the area dry, then vacuum or blot it with a solution of vinegar and soapy water. Repeat if required. Remove urine odour from mattresses: Wet the area, then rub some dry powdered borax directly into the stain. Let it dry, then hover up the powder. Cleaning windows and mirrors: Want streak free, squeaky clean windows and mirrors? Wash with a clean sponge dipped in 2 tablespoons borax dissolved in 600ml of water. Remove mildew from upholstery fabric: To remove mildew from upholstery and other fabrics, soak a sponge in a solution of 125g of borax dissolved in 350ml of very hot water, and rub it into the area affected. Let it soak for a number of hours until the stain disappears, then rinse well. Remove stubborn sink stains: Remove stubborn stains from your stain-less steel or porcelain sink. Make a paste of 250g borax and 60ml lemon juice. Put the paste on a cloth or sponge and rub it into the stain well, then rinse with running warm water. Laundry Cleaning booster: ½ a cup of Borax in every load of wash along with detergent will boost the cleaning power of your detergent. Deodorizing Rubbish Disposals: Sprinkle a 3-4 tablespoons of borax down the drain, leave for 30 minutes and flush the drain with warm/hot water. Deodorizing Bins: Soak the bin with a mixture of hot water and 250g of borax to eliminate odours. After it has dried, add some dry borax powder to help prevent further smells. The short answer is Yes, Borax can be handled like table salt and short term exposure presents very little risk. Before the year 2010 you could enter your local chemist or pharmacy and pick up some borax easily. It was used for many things and hailed by some as a “wonder powder”. Then in June 2010 the ECHA (European Chemicals Agency) submitted a supporting document to the Member State Committee to request reclassification of Disodium TetraBorate, Anhydrous (Borax) and it hydrated forms because of its repro-toxic properties. 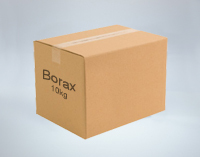 Borax is now listed in the ‘Substances of Very High Concern’ list and it has been reclassified as Hazard class – Re-protoxic, Category – 1B. Any product that contains above a particular % concentration of borax (about 4-8%) should display the warning “May damage fertility, may cause harm to the unborn child” and be restricted to professional use.